Jack Black is thrilled when his father, the captain of the largest airship in the world, invites him on the ships maiden voyage. Once aloft, Jack overhears a plot to sabotage the ship. But before he can tell his father, Jack falls, plummeting through the air to be caught in the sails of a pirate ship. 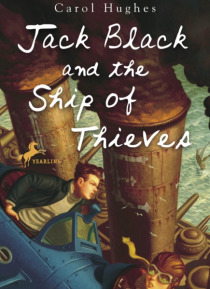 Now Jack must try to convince a crew of thieves to rescue his father. . . . In this robust blend … of fantasy and whirlwind adventure, Carol Hughes confronts the difficult, real-life issues of trust, loyalty, and deception.From the Trade Paperback edition.